Police at the scene of the fire in Gladstone Place, Woodside Aberdeen. Picture by Chris Sumner. Residents of a quiet Aberdeen street have described their shock after a fatal house fire. Emergency services were called to Gladstone Place, in the Woodside area of the city, at around 4.10pm on Friday after smoke was seen. Police later confirmed that a 53-year-old man had died in the blaze and a joint investigation with the fire service has been launched to establish a cause. 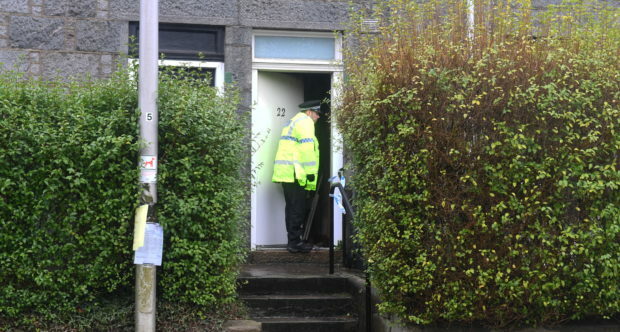 Detective Inspector David Howieson of Police Scotland said enquiries were at an early stage, but added there did not appear to be any suspicious circumstances. A spokesman for the fire service said three appliances, all from Aberdeen, were called to attend the incident. Yesterday, the bottom floor of the two-storey home had been covered up with wood, but the top floor appeared relatively unharmed. One resident of the street said: “I had been out working when it happened, but came back to hear there had been a fire on the street. Another said she had awoken from a rest to see smoke pouring out of the building. She added: “I was just taking a nap when I woke up and saw all the fire engines and smoke coming out of the building. “The fire didn’t look that big, but there were quite a few engines.